Air Conditioned Villa, Heated Pool, Jacuzzi, Fab Garden, Backing Golf Course. 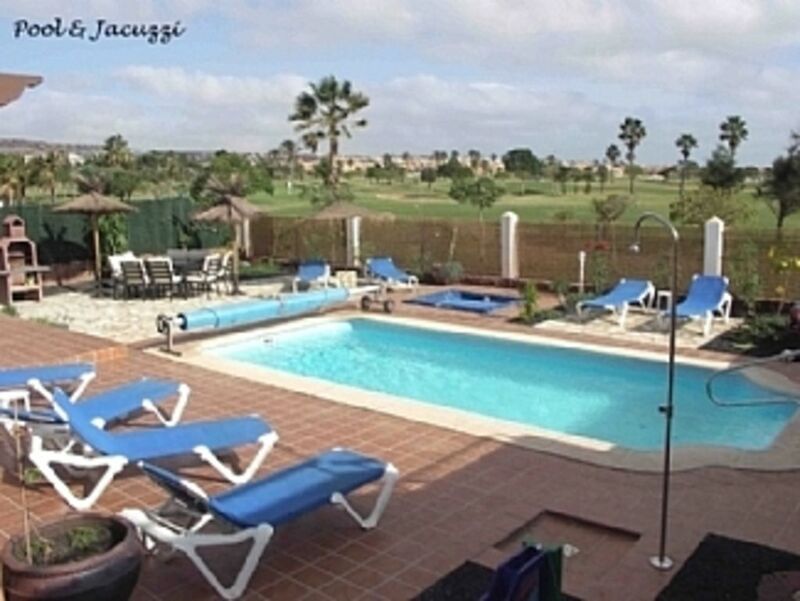 Villa in Fuerteventura Golf Course, Caleta De Fuste, well positioned in Las Cascadas. - Peaceful Location,10 Min Walk to Lagoon Beaches, Superb Atlantico Foreshore, restaurants & shops.. Beautifully appointed villa, spacious enough to cater for families/parties of 8. Outdoor pool table and giant garden chess, Draughts, Connect 4. A bright and airy feel, with high ceilings, a large family lounge and separate dining room. The air-conditioning is remote controlled separately for each bedroom. Fan used in Lounge.The terrace and patio areas again give the feeling of space and look directly over the 5th green of the Fuerteventura Golf Course. Two 'Al Fresco' seating areas and plenty of sunbathing space. A fixed sunbathing parasol has been positioned to allow a shady spot. A Cabana with soft seating for relaxation. Indoors, guests may relax and watch Sky TV (Not BBC/ITV), DVDs, ipod station with speakers/ PS3/wifi. The villa has a 'strictly no smoking inside' policy but smokers are invited to take full advantage of the outside patio areas. The Atlantico foreshore with beautifully kept lagoon beaches, four hotels, superb supermarket & shops is just a ten minute stroll away. En-suite bathroom to master with bath/shower over, wc, bidet and his n' hers marble vanity sinks. Main bathroom has large walk in shower, wc and single marble vanity sink. Oven, hob, extractor hood, microwave, dishwasher, fridge/freezer. All crockery and glass ware including an extensive range of plastic ware for use pool side and for the BBQ. Golf hotel and club is ten minutes stroll away. Villa overlooks both the Fuerteventura Golf course and Las Salinas Golf Course to the South. Immediate views of 5th fairway and green from garden patios. Notes on accommodation: The villa has seperately air-conditioned bedrooms. Fans to Lounge area. There is a telephone entry system at the front gate. There is a 4' high wall to the front and other boundaries are fenced and screened at 6' high. We have shaded Cabana's for playing pool or relaxing. Outside: Swimming pool 8m x 4m, max depth 1.5m. Completely private, solar cover. Heated. Jacuzzi in ground for 3 persons (1 laying, 2 sitting). Canarian BBQ, seating for 8, fixed parasols, sunbeds for 8. Extra seating on BBQ Patio. Outdoor pool table, Giant Chess, draughts, Connect 4. Two shaded Cabanas. Utility Room: Washing machine, iron and ironing board, vacuum and house work utensils. Cleaning / Towels / Linen / Maid service: Towels and linen included. Guests may prefer to bring bedding for cot. Beach towels available. Towels and linen changed weekly. A more frequent change may be arranged with the management company and any fee, paid to them directly. Other: Open plan dining room opening into lounge area. Seating for 8, with patio door leading onto terrace. Hi/low chair. The property was very well equipped with crockery, books, toys, DVDs, play station, bbq equipment. The property was very clean and there has obviously been a lot of thought gone into planning that there is everything one would need for a great holiday. Lots of towels, hair dryers in every room, good mirrors, lots of crockery, bbq equipment etc. Pool is great and the hot tub a winner every time. Jan - who welcomed us was very friendly and was easily contactable. Alice - the owner - sent a comprehensive list before we went on holiday and was always available should we have needed to contact her. She checked when we got back that we had been happy in the villa. All in all - a great family villa. Thankyou so much Dorothy for such a lovely review. We loved having you as guests and would welcome you back happily anytime you wanted to visit again. I am really pleased you and your family had a good stay, Have a lovely year. All my best and Thankyou again. Good villa and good location. Staying on the villa from 30 October for one week. You can find everything what you need inside the villa. Barbecue area amazing. Warm swimming pool.Big roof terrace.About 15 minutes walk to nearest beach. Will back again to villa. Thankyou for your lovely review. So pleased you and your family had a good stay. We look forward to having you back to stay again. The perfect villa, owner and management team. The perfect villa, which, on arrival was immaculately clean and maintained. Jan and Ricky the management team cannot be praised enough, thank you. Corrine and Alice were brilliant supporting us and ensuring we had a perfect holiday. Thank you. We would certainly recommend this villa to family and friends and in fact have already done so. We are also currently looking at re booking for next year, having been back only back 2 days. Thank you so much for such a lovely review. We love the island and the villa very much so it makes me so happy when other families feel the same. All my best, We would adore to have you back anytime. Our first holiday with our children as adults with their partners and this was the ideal villa, so much space and plenty to keep big and little children entertained, the villa was so clean and arrival presentation was immaculate you would think it was new. Felt like our own after one day. Beautiful beaches and friendly bars 10 minutes walk, main town accessable by 20 minute walk or excellent cheap taxis. Thankyou. We stayed at Casa Piedra for 3 weeks this summer and we can truly say that it was the most perfect holiday we have ever had. Corinne the owner is such a lovely lady. The villa itself is stunning and so well thought out. The location is beautiful and peaceful and perfect for a family holiday. Staying here has made us fall in love even more with the island. Every time we come back it feels more and more like home, especially staying in one of Corinne's villas. Many, many thanks once again for making a much needed holiday so very unforgettable Corinne. Beaches are just a 10 minute stroll away. Airport is only 15 minute transfer by car. Car not essential. Main town of Caleta De Fuste is a 20 minute walk away. Plenty of shops, restaurants etc. Booking Notes: I ask a rental of £1200 for each Christmas and New Year week ie 23rd December 2015 to 6th January 2016. A £100/100 euros refundable breakages deposit is taken on arrival at the villa/returned on departure unless significant damage has occurred. (we accept the odd broken glass etc). I send out receipts and keep in touch with future guests, ensuring that all queries are answered. I like guests to feel confident, beginning to enjoy their holiday as soon as they set foot in Fuerteventura. Changeover Day: Flexible changeover day. Endeavour to accommodate all guests, arriving and departing with respect to their flight times. When this is not possible eg; High Summer, 10am departure and 4pm entry may need to be adhered to.